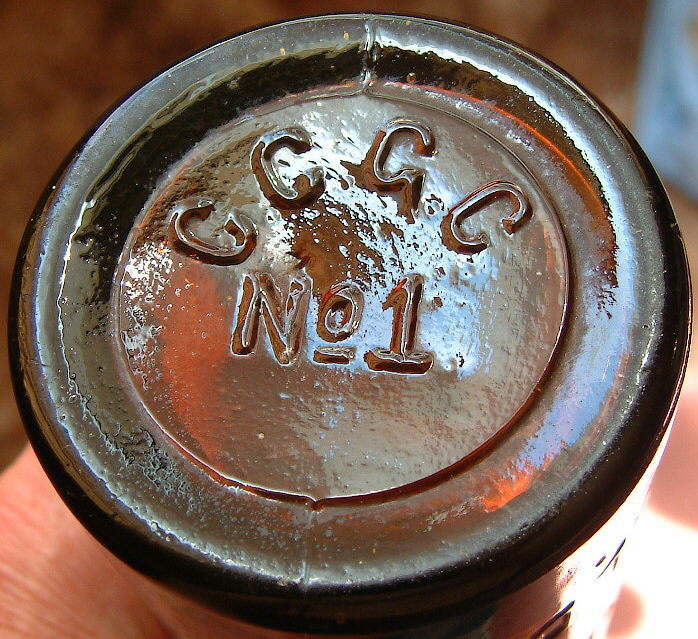 The subject of bottle makers marks is a complex one - as is virtually everything to do with bottle dating and identification. 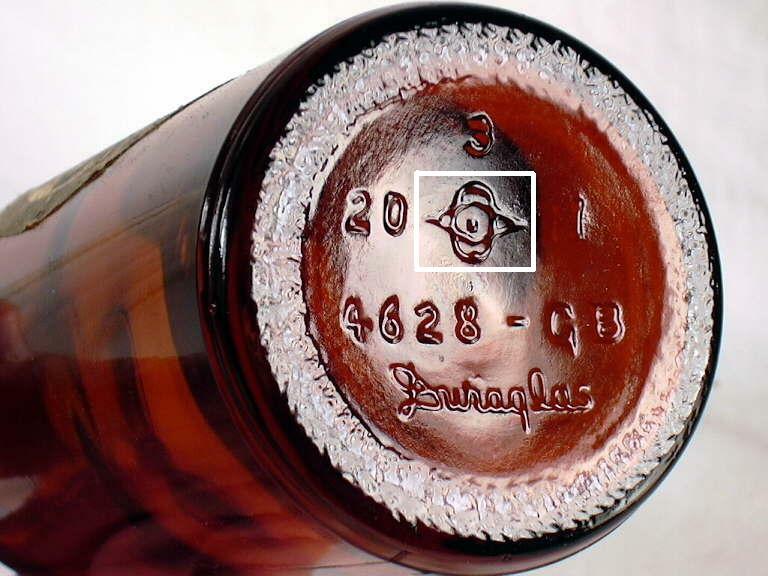 However, the subject is important to refining the estimated date range for the manufacture of a bottle, how the bottle was made to some extent, and for the determination of origin (website "goals" #1, #3, and #4 noted on the Homepage). Some glass containers make quite obvious which glass company made the item. 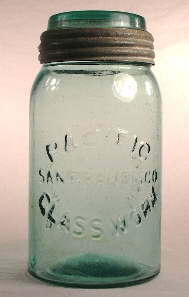 For example, the quart canning jar pictured to the right is boldly embossed on one side with PACIFIC / SAN FRANCISCO / GLASS WORK (sic) making it easily clear that the jar was manufactured by the Pacific Glass Works of San Francisco, CA. - the first successful glass company west of the Rockies - which operated under that name from 1862 to 1876 (Toulouse 1971). The pictures to the left show the base of an 11 oz. beer bottle (and the entire bottle) which shows the some of the distinctive marks that the Owens-Illinois Glass Company - which had many plants around the country - used beginning in 1929 or 1930 to at least the mid-1950s. 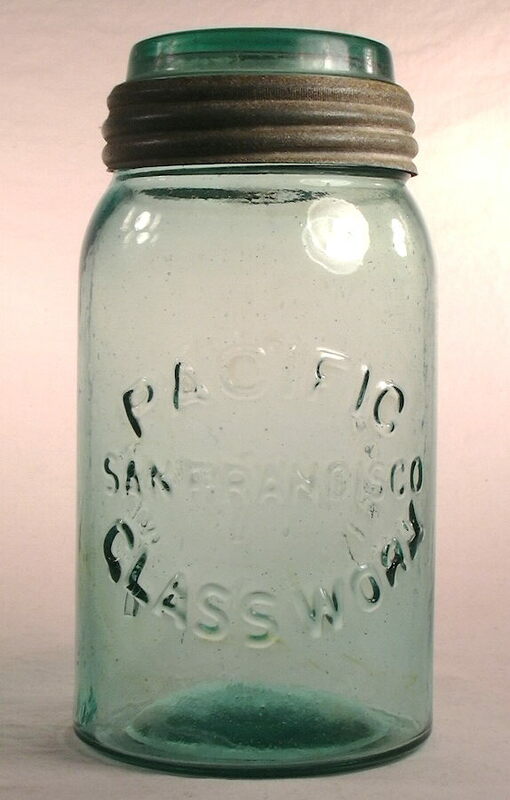 More specifically, the marks on this particular bottle indicate it was made in 1941 ("1" to the right of the diamond O-I mark) at the Oakland, CA. plant ("20" to the left of the makers mark). Why not 1931 or 1951? See the machine-made bottle dating page Question #11 for more information on this bottle. 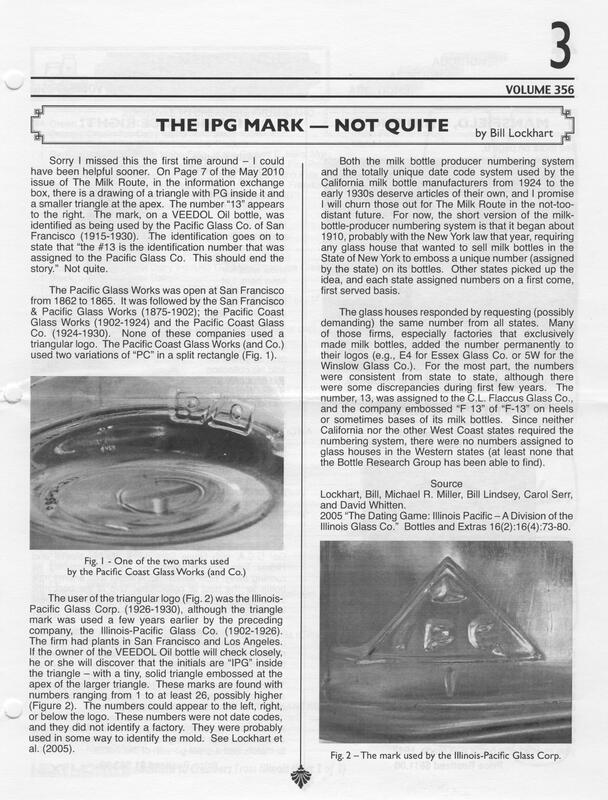 Also consult the article by Bill Lockhart - located at the following link - for more information on the marks of the Owens-Illinois Glass Company, whose marks are probably the most commonly encountered U. S. makers marks of the 20th and early 21st centuries (Lockhart 2004d). Note: An extensively revised version of the above linked article, by Bill Lockhart and Russ Hoenig (retired senior engineer - Owens-Illinois Glass Co.) is available as of March 2015. Click on the following link: Updated Owens-Illinois Glass Company article. This important website section is devoted largely to the published articles of the Bottle Research Group (BRG) members - past, present...and future (more below) - on most major bottle producers in the U. S. and a few Canadian, Mexican and English manufacturers...all free of charge! This work will be a massive treatise on American glass container manufacturers from the late 18th century to the present day. These new/revised articles are noted below followed by the publishing date. Supplementary files to complete each alphabetical section - e.g., "Preface/Introduction & Table of Contents" and the pertinent "List of Factories" and "Logo Table" of actual bottle markings - will also be listed in the appropriate alphabetical section. Currently (December 2015) the "A" through "G" Makers Markings sections are complete. Take a look at these sections below which if printed out (well over 2000 pages so far!) in their entirety comprise the first five volumes of the "Encyclopedia of Manufacturers Marks on Glass Containers." This is the pattern to be followed for subsequent volumes. In the shorter term, preliminary PDF copies of all the alphabetical "Logo Tables" - tables of the actual markings, the associated glass makers that used them and and dates of use - have been posted in their entirety here with the actual manufacturers articles to be added later as part of the multi-year project to complete the "Encyclopedia." These "Logo Tables" are all being listed along with a short "Introduction" in the box immediately below this section and above the "Encyclopedia" boxes. All of the draft and some final logo tables have been loaded below including one version which includes ALL of these tables combined into one downloadable file although it is out of date (to be revised upon completion of the entire work). These tables in total comprise a quick reference guide for the identification & dating of makers markings found on historic bottles! 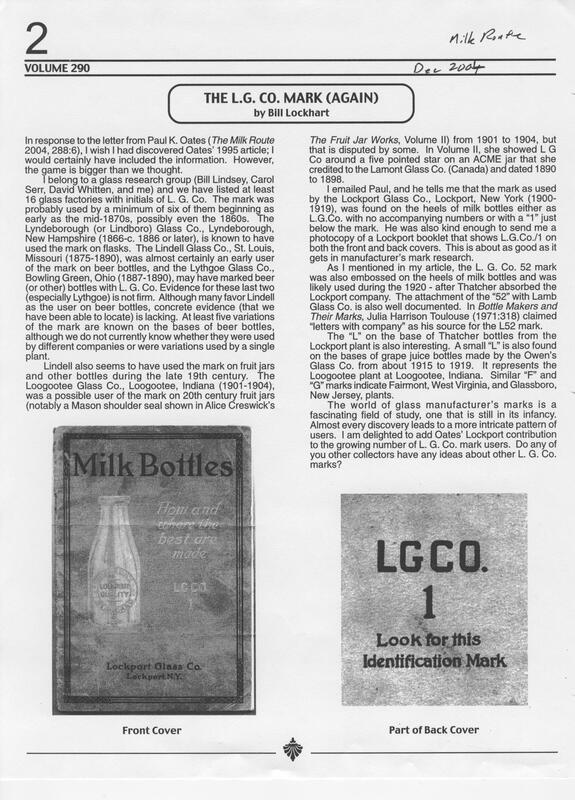 The articles listed further down the page (below the "Encyclopedia" alphabetical boxes and entitled "Previously Published Makers Markings Articles") are those published via other venues - primarily in "Bottles and Extras" which is the official publication of the The Federation of Historical Bottle Collectors (FOHBC). Although virtually all of these older articles are or will be superseded by updated web published articles, they will continue to be listed and available here as published articles of use as references. All articles - previously published or new here - are also all found in the "Periodical & Journal Articles" section of the Reference Sources/Bibliography page. *Currently a preliminary draft pending completion of the related articles. A Tale of Two Glass Factories: Lockport Glass Co. & Loogootee Glass Co. Virtually all of these articles have been or will be replaced in the years to come by the Encyclopedia of Manufacturers Marks on Glass Containers articles listed and linked in the boxes above. They will, however, continue to be listed and available here as previously published "legacy" articles of use as references. 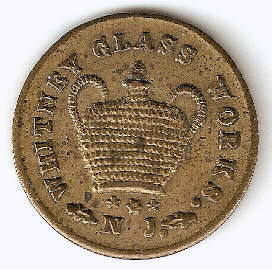 The Knox Glass Bottle Co. 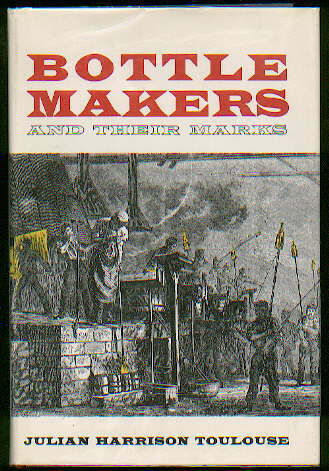 The classic published reference on the subject of maker's markings, as noted above, is the aptly named Bottle Makers and Their Marks by Dr. Julian Toulouse. Published in 1971, this book is a good source of information on bottle makers marks and the history of the companies that produced them. 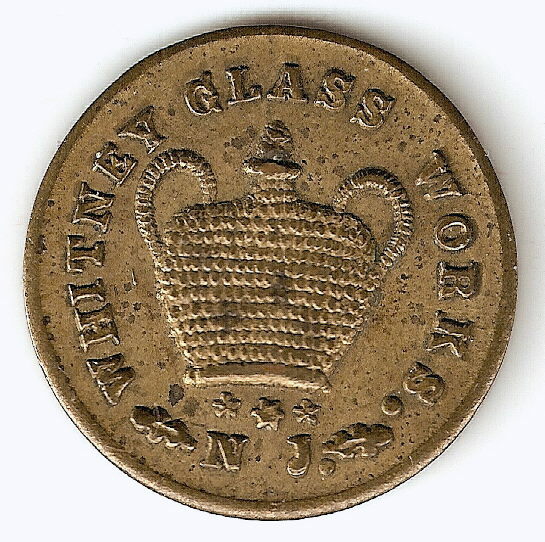 To quote from David Whitten's website - "(Toulouse's)...book is the best reference work ever published on glass manufacturers' marks on bottles, but it does contain many errors which have been discovered...since it was first published." A plethora of new information has been uncovered and older inaccurate information refined since the publishing of the book, much of which is now or soon to be available on this website as noted above. Regardless of that, Dr. Toulouse's book may still be a useful "quick" reference source for maker's mark information. When used in hand with the information provided on this page a bottle information seeker has powerful tools in their quest to find bottle dating "truth." 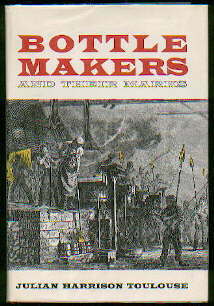 This book is currently being reprinted by Blackburn Press; check the Historic Bottle Related Links page under Toulouse (1971) for a link to this website and the reprint. It is not cheap but may be worth it. Return to the Glassmaking & Glassmakers page.